Photo collage canvas prints are beautifully printed and assembled. Made to order on strong, high-quality frames. Using our design interface, generate and create your own montage automatically then preview the collage to approve it before you buy. 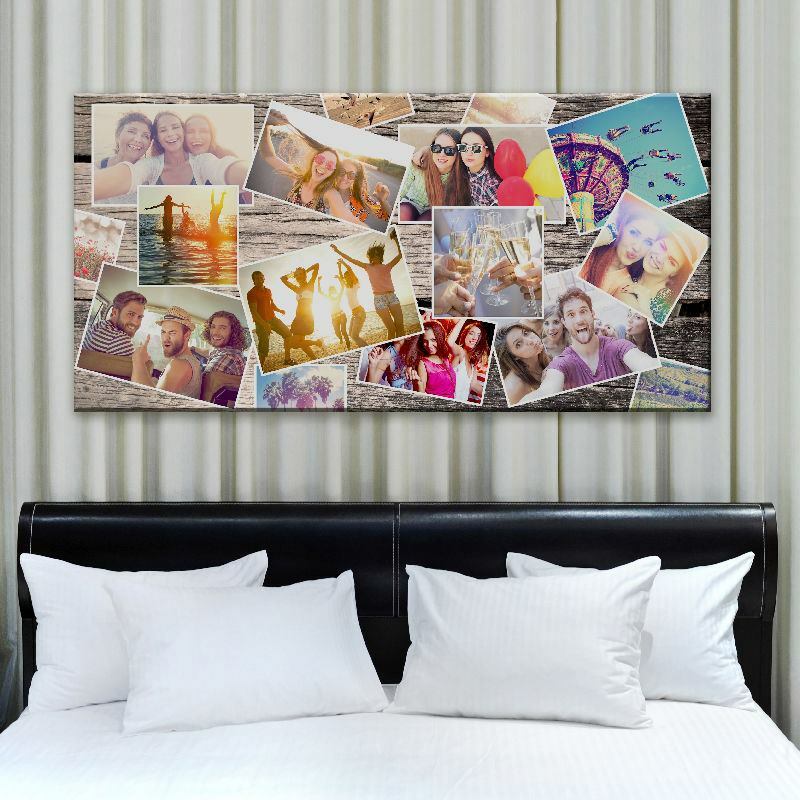 Use a collage canvas template, or arrange your photos yourself. We love creating montages for a multi photo effect. They are easy and free to make in our system. Press start design above, add a selection of photos and click the make montage button. You can see the layout in different template styles and mix it up to make another version very easily. We also feature a free printable download of the same montage so you can make a small A4 or A3 poster paper print too. You will see this in the gallery at the time of making the montage. Stunning. 10/10. Photo turned out great, my partner and I are thrilled with the outcome. I loved that I could chose the size I wanted and it was so easy to do! Excellent quality Excellent service So easy to order and speedy delivery. I will be ordering again. Quality was excellent so too was the service.............I'm just about to place another order. There are a few templates which give you ways to design your canvas montage in our system: "Overlap", "Photo frame" or "Heart montage". Each of these have the option to be printed on a plain background, or with a photo on the background. If you prefer you can select the option to do it yourself. You will be given the chance to preview your personalised photo collage canvas before confirming your order. Once you are happy with your design, submit your order and we will get started with making it. You have a choice of frame depth - either 2.5cm or 4.5cm - and also a choice of wrap for your canvas. We use gallery wrap as standard, where the image continues and is wrapped around the sides of the frame (bleed). But we also offer a mirror or no wrap if you prefer, if this suits your image more. Read about wrap options. Your design will be printed onto a high-quality woven canvas fabric. A frame for your collage canvas will be handmade from FSC Certified pine wood, and we will then hand stretch your canvas over the frame. Using eight high-quality FSC wedges, and stretcher bars to secure your canvas in place. All of them are available with no charge to design, and you preview before you buy. You select the design type in the order process. We love the filmstrip idea. With a classic three photo or four photo design, or give us up to seven images and we will place them on a film-strip. It is a great way to display your favourite photographs. Visit our Filmstrip Montage page.